Brush and brown ink with brown wash and black chalk on paper. Inscribed on verso, in brown ink: "[...]"; "4-6-/2-9-/3-10-/[...]-0-/2-2-/2-15/ [...]". P. & D. Colnaghi & Co., Ltd., London; from which acquired by Joseph F. McCrindle, New York, 17 August 1966 (McCrindle collection no. A0706). Watermark: Small house with chimney. 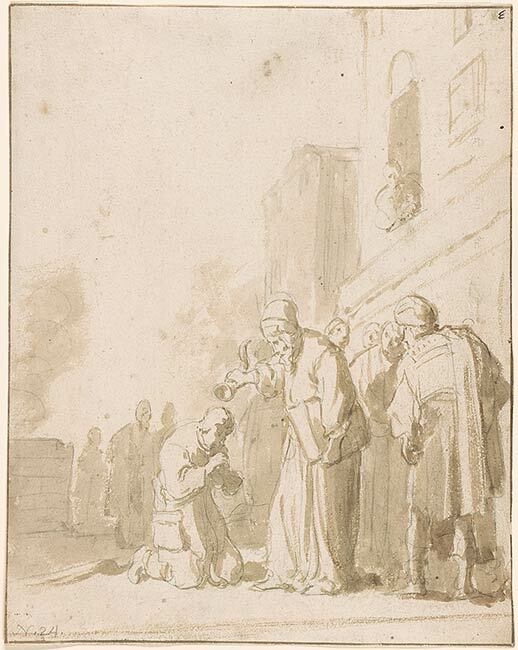 A priest anoints David in this delicately rendered drawing by the Dutch artist Claes Cornelisz Moeyart, a leading Catholic painter who worked in Amsterdam. The scholar Egbert Haverkamp-Begemann feels that this drawing should be attributed to Moyaert as it is similar to other drawings by him executed in the later part of his life, especially those in the 1640s. Like his contemporaries Gerard van Honthorst (1592-1656) and Rembrandt van Rijn (1606-1669), Moeyart masterfully handled plays of light and shadow, creating great volume as can be seen in the expansive background rendered through washes in the present sheet.